The French Spiderman Alain Robert scaling the Makati skyscraper this morning. The self-styled French Spiderman, Alain Robert, has been arrested after he scaled a Makati City skyscraper without safety equipment. He is now detained at Makati Police Station for causing a public disturbance and trespassing after his stunt today (Tuesday, January 29). 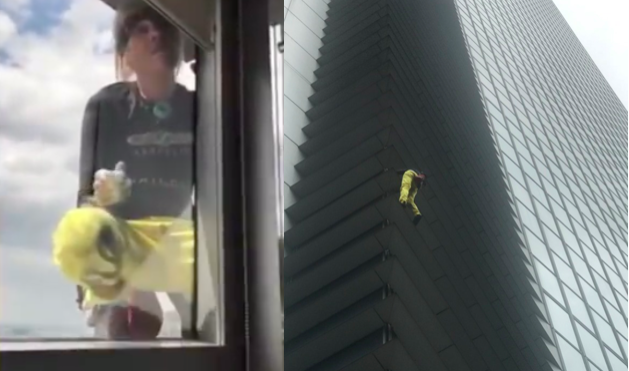 Authorities said bystanders reported the incident to police after Robert started his ascent of the 43-storey glass-walled GT International Tower on Ayala Avenue at about 10.40am. Robert’s legal representative, Howard Calleja, said his client arrived in the Philippines last Friday with the intent of scaling a tower to “add to his list of achievements”. Robert has scaled more than 100 structures without ropes or other safety equipment, setting a Guinness World Record for “most buildings climbed unassisted”. His conquests include many of the world’s most iconic buildings, including the Eiffel Tower, the Sydney Opera House and the Petronas Twin Towers in Kuala Lumpur. The French Spiderman has previously admitted that his lifestyle “isn’t easy” for his family and accepts there are many members of the public worldwide who condemn him. Speaking after a climb in London last year, he said: “It is never easy for family having a dad who is doing that kind of stuff but they are used to it. They never asked me to change my lifestyle. Robert isn’t the first Frenchman to have fallen foul of the law after pulling stunts on Philippine skyscrapers. As we reported in January 2016, YouTuber David Laffargue and his friend Nathan Pertusat were arrested for base jumping from a tower in Cebu City. Put his name in the ‘Blacklist’ before deporting him.